Mobile design is rapidly changing, and so the techniques also evolve. Checkout my newer tutorial on Responsive menus for 2017 and onward here. The purpose of this tutorial is to show you how turn a regular list menu into a dropdown menu on smaller display. This trick is more useful on navigation with a lot of links like the screenshot below. You can condense all the buttons into an elegant dropdown. Here is the markup for the navigation. The <nav> tag is required to create the dropdown with the css property absolute position. I will explain this later in the tutorial. The .current class indicates the active/current menu link. The CSS for the navigation (desktop view) is pretty straight forward, so I’m not going to get into the details. Note that I specified display:inline-block instead of float:left for the nav <li> element. 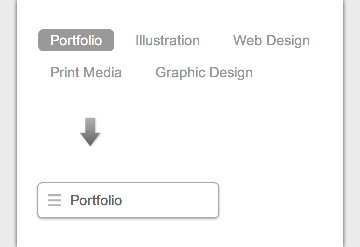 This allows the menu buttons to be able to align left, center or right by specifying text-align on the <ul> element. As mentioned above, you can change the alignment of the buttons by using text-align property. HTML5 <nav> tag and media query is not supported by Internet Explorer 8 or older. Include css3-mediaqueries.js (or respond.js) and html5shim.js to provide fallback support. If you don’t want to add html5shim.js, replace the <nav> tag with a <div> tag. Now here comes the fun part – making the menu responsive with media query! Read my previous articles on responsive design and media query if you are not familar with responsive design. On 600px breakpoint, I set the nav element to relative position so I can place the <ul> menu list on top with absolute position. I hide all <li> elements by specifying display:none, but keep the .current <li> displaying as block. Then on the nav hover, I set all <li> back to display:block (this will produce the dropdown list result). I added a check icon graphic on the .current element to indicate it is the active item. For the center and right alignment menu, use left and right property to position the <ul> list. View the demo to see the final result. Great tutorial. Simple and easy to follow. I’ve just tested this on my iPhone and a problem is that it seems to rely on the hover state which doesn’t really exist on a touch screen. The dropdown reveals on a tap but then can’t be dismissed, it stays open. So if you tap the menu button to see what’s on offer but decide to stay on the page you are stuck with it blocking out content. I experienced the same thing when I went through this tutorial. Also, on my iPhone it won’t load the mobile nav when the max-width is 600px for the the @media screen. It needs to be greater than 960px I do believe, I set mine to 1000px. Also, I don’t think you included the code to change the current state of the active links. So the first link always has the different background color even when you navigate to a different page. If I’m mistaken or you have the tweak, let me know. How can this be improved for mobile devices? So maybe no hover, but a click on a ‘Go To..’ to open the navigation. The hover never closes on my iPhone. Let’s improve this, bro. I think it would be better if the collapsed menu button said ‘Menu’ or ‘Go To’ or something rather than ‘Portfolio’ – then it would be more obvious that items can be accessed via the dropdown. You legend! That’s a really nice way to tackle menus. I’ll be trying this out asap! It doesn’t work on Android either. As soon as you click on the navigation it jumps to that page. What you really need is either a placeholder line that expands the menu on click without being a link or to disable the current link. It’s nice but it lacks basic accessibility. If you try it on an iPhone with VoiceOver you notice how little help you get from the markup to be able to navigate the menu correctly. You’re right. I’ll also add that it’s not usable via keyboard navigation (Tab) which, today, is a minimum requirement for production use. Not sure the ‘extra work’ required for it to be fully usable (with the other bugs mentioned here) is worth the no-JS hassle. I agree with Paul Frost – the hover state does not exist on touch devices! It’s only simulated. Hover properties are only simulated. Using a click event is much more reliable for touch devices – which is presumably what we’re building responsive websites for, right? I’d have to agree with Rachel, you might think the hover is user friendly, but you’re making the menu unusable on smart phones. Phones don’t have cursors, you need a click state which will drop the menu down. I guess I’m not the first to say… The hover state doesn’t exist on mobile. Very nice tutorial and clean code. I also like that this menu can easily be right-, left-, or center-aligned. Doesn’t work on winmo8, and I haven’t been able to test it on android yet. This menu could use the checkbox hack to emulate a click event, but I don’t have data on mobile device support for that, so JS dependent click event seems like the only option. Can you share a link to it instead? wondering – can you just add :focus to the hover state and use a placeholder that’s not a link for the Menu button ? This navigation menu works on Android and iOS and I appreciate that it also works fine on IE9 and Firefox. That’s very good discovery and innovative use of Html 5 markup. Great resource, thanks for sharing. Do you have samples of this working with any WordPress themes? Very nice tutorial, thank you!! However, can you post or suggest a source for icon-menu.png and icon-check.png? Doesn’t seem to work at all on an Android phone with Opera. Simple and easy navigation is a very important factor of responsive web design. Here in this blog you have shared the best CSS navigation menu that will help designers a lot. This is a great article demonstrating a nice approach to tackling mobile nav. There are a bunch of different ways to Well done! Looks Nice, I’ll give it a go on Redesigning for MY company site !!! Thanks! It looks great and works on ios – but I can’t get it to work on WinMo 8. I have one issue with this implementation and that is that once one of the links is clicked, the menu does not disappear. I find it looks really awkward in my implementation, and on my mobile phone it makes for a very bad UI, since the whole screen is taken up by the dropdown menu. This is a great tutorial. Is it possible to get a sub menu working in this design? I cant figure it out. Any help would be fantastic. The only problem is hover-off doesn’t work on mobile devices, so once you open it on a mobile device, it stays open. Bootstrap’s menubar allows you to click and re-close the menu, yours does not. Why not add that functionality? I will look into it myself. Thanks. Interesting article and CSS but what are your thoughts on hamburger menus? I’ve read quite a number of articles now on studies that show that the hamburger menu is actually a detriment to navigation. Even in spite of the World being quite used to mobile, so many people still don’t really ‘get’ the hamburger menu concept. I know when Nick originally wrote this tutorial, the hamburger menu was just beginning to be used widely in mobile UX. Nowadays it is everywhere even on desktop designs. I think there is definitely some merit in minimal UI for navigation, but don’t specialize in UX so can’t say for sure if it is good or bad. I do know that on mobile, it is pretty much standard and better understood by mobile users. so in the context of this tutorial it works in that you’re converting an expanded, semantic menu into a condensed toggle for mobiles only.